Everyday people are more powerful than ever. So creating value in the world today is not just about selling things, but also inspiring people around a greater mission. Ideally, an organization’s greater mission inspires people to use their power — not just purchasing power — to actively support the mission; with participation, advocacy and even co-creation. Wikipedia inspired people to use their power; Encyclopedia Britannica did not. 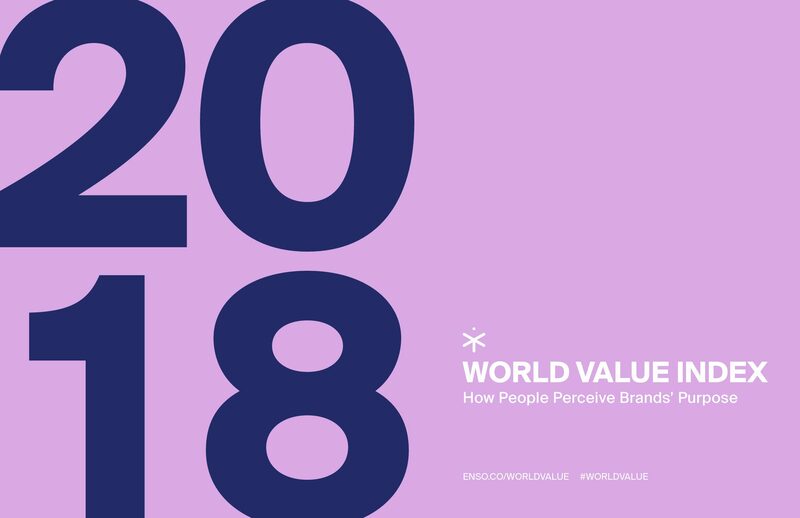 Enso’s World Value Index measures the extent to which Americans are inspired by brands’ missions — and the extent to which that inspiration drives active support and purchase. 91% say living life with a sense of purpose is important to them. 81% say business can be a force for positive social and environmental change. 42% say the values of their employer match their own. 36% say they trust business leaders to do what is right.